Chateau du Tariquet distil their age statement Armagnacs from only the best Folle Blanche grapes, recognised as one of the most flavoursome of grapes, but also one of the most difficult to grow. Indeed, Chateau du Tariquet is one of the largest estates in the Gascony area (which is known for its nutrient rich soil, producing an intensely flavoured grape), but of their gigantic grounds, only 25 hectares are set aside for the production of Folle Blanche. Therefore, these age statement Armagnacs (already something of a rarity) are fairly limited in quantity, so should be snapped up pretty fast! The Domaine is highly traditional in the production of their Armagnac, using a direct-wood-fired continuous still. The flavour of this Armagnac is a testament to the spirit’s outstanding quality, with rich oaky notes of vanilla and caramel supported by a decadent grape flavour throughout. A truly luxurious Armagnac that would be ideal as an after-dinner digestif. 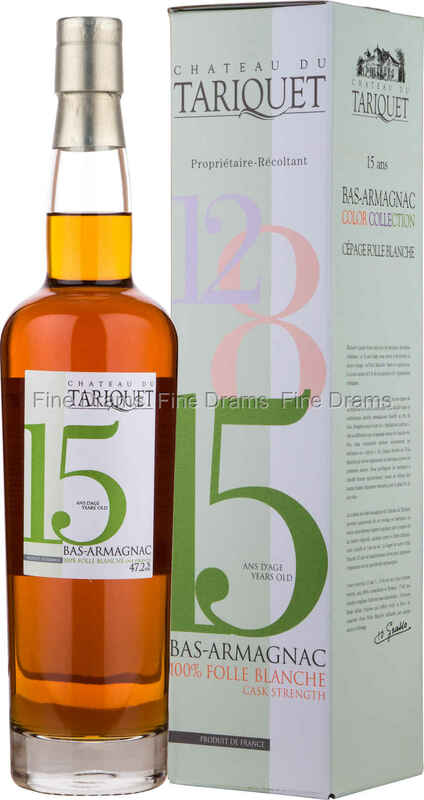 This Armagnac is bottled at a cask strength of 46.8%.